Running a guest operating system inside a virtual machine. A printable PDF version of this document is available at https://genode.org/documentation/sculpt-tc.pdf. Sculpt for The Curious (TC) is the second of four revisions planned for 2018 with a successively increased ease of use. In constrast to the initial version, it introduces a graphical user interface for performing fundamental tasks like connecting to a wireless network. Sculpt TC expects that you already know your way around Genode's source tree and tool chain. Should this not be the case, please consider the "Getting started" section of the Genode Foundations book that is available as a free download at https://genode.org. Exiting Vim (:x save and exit, :q! discard changes). Sculpt TC should be compatible with recent Intel-based PC hardware featuring Intel graphics, E1000 networking, Intel wireless, and AHCI. It is tested best on laptops of the Lenovo X and T series (X220, X250, X260, T430, T460). For experimenting with Sculpt, we recommend getting a refurbished version of one of these. You may also find the unofficial hardware compatibility list http://usr.sysret.de/jws/genode/hcl.html helpful for finding Genode-compatible hardware. Sculpt has been tested with screen resolutions up to 2560 x 1440. Displays with a higher resolution are not expected to work. The sweet spot is a full-HD display. Even though Sculpt is able to run without an IOMMU, we advise to enable this option for the sandboxing of device drivers. Hardware-assisted virtualization is needed to run VirtualBox on top of Sculpt. Sculpt is usually booted from a USB stick. Sculpt TC boots via UEFI by default. The boot image is specially prepared such that it can be started via legacy boot on older machines. However, booting it via legacy boot on a modern machine is hit or miss. The Sculpt TC boot image is not cryptographically signed. If the latter is not set, the hardware may behave erratically (e.g., non-working trackpoint when on battery). The following steps assume that you have the Genode tool chain installed on a GNU/Linux system. For reference, Ubuntu 16.04 is known to work well. The content is downloaded to the public/ directory and extracted to the depot/ directory. Configure the build directory by editing build/x86_64/etc/build.conf. Most importantly, enable the gems source-code repository where the Sculpt scenario resides. In addition, the ports, dde_linux and dde_ipxe repository are needed as well. Second, change the default configuration of the QEMU_RUN_OPT variable to image/disk instead of image/iso. This way, the build process will produce a valid disk image with a GPT partition table instead of a legacy ISO image. The boot image is created at build/x86_64/var/run/sculpt.img. Here, /dev/sdx refers to the device node of your USB stick. To determine it, you may inspect the output of dmesg after plugging it in. Unless customized, the Sculpt base system resides as a self-contained live operating system on a USB stick, not installed on disk. This has two advantages. First, it makes the update of the base system straight-forward and completely risk-free. Simply install the new version on a second USB stick. Should the new version cause any trouble, one can fall back to the original one by swapping the USB sticks. Second, it alleviates the need to install any boot-loader infrastructure on disk. In fact, we will not create a partition table and use the entire disk as one file system. Note that Genode is not limited to booting from USB. It also supports the use of partitions. But for this guide, we keep things as simple as possible. 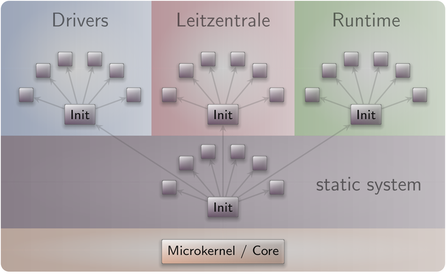 The Sculpt system consists of four parts living on top of the microkernel (Figure 1). The first - static - part of the system is baked into the boot image. It contains components that must be shared by the upper - dynamic - parts and defines the relationships between the upper parts via a static policy that is fixed by the creator of the boot image. Besides a low-complexity GUI multiplexer called Nitpicker, the static system contains two in-memory file systems. The config file system stores configuration data whereas the report file system stores information reported by components. These file systems are invisible to regular components. Components obtain their configuration data from a (read-only memory) ROM service, and report their state to a (write-only) report service. At boot time, the config file system is pre-populated with information from the boot image. It stays in memory. Hence, after rebooting the system, any changes are gone. The drivers subsystem provides all the basic services needed to realize an interactive system scenario: a framebuffer service for the graphical output, an input service to obtain user input, and a block service to access a storage device. All other drivers like networking or audio drivers are not covered by the drivers subsystem. They will enter the picture at a later stage and will use the platform service and USB service to access device resources. As illustrated by Figure 3, some drivers like the framebuffer driver live in a dynamically managed subsystem that depends on runtime discovery of the hardware by the so-called driver-manager component. Whenever an Intel graphics device is present, the Intel framebuffer driver is spawned. Otherwise, a generic VESA driver or a driver for a boot-time-initialized framebuffer is used. Several components of the drivers subsystem report their state. E.g., when the Intel framebuffer is used, it reports the list of connectors present. Most importantly, the driver manager reports the available block devices. As user input may enter the system in multiple ways - most prominently PS/2 and USB HID - the drivers subsystem contains a so-called input-filter component that merges these event streams and applies transformations like key remappings or mouse acceleration. The Leitzentrale gives you - the user - full control over the config file system and the report file system. You are free to inspect and manipulate the system in any way you wish. The German term Leitzentrale refers to a control center that requires a certain degree of sophistication from the operator, which would be you. A typo at the wrong place may render your system temporarily inaccessible, eventually requiring a reboot. But don't be afraid. Since all manual changes performed in the Leitzentrale occur in memory only, you are not at risk of permanently bricking your machine. The Leitzentrale can be toggled at any time by pressing F12 and will be enabled right after boot. It presents itself with a minimalistic GUI for accessing the storage devices attached to your machine and for configuring your network connectivity. Most importantly, however, it allows the user to spawn an interactive shell for manual config and report file systems access. To spawn this command-line interface, click on the "ram" item from the menu and select "Inspect". The inspect window hosts a small Unix runtime called noux (Figure 4) as user interface. Don't let the presence of a Unix shell mislead you. Sculpt is not a Unix system. It merely uses Unix subsystems in the form of noux instances as convenient tools for managing and editing files. Within the inspect window, you can interact with both the report and config file systems using familiar commands such as the bash shell, a subset of coreutils, and Vim. Besides the interactive shell, the Leitzentrale employs a noux instance that gives you a quick glance at the most recent log messages. The log is also available at report/log and can be browsed with Vim in the inspect window. Noux is not bullet-proof. Should you get stuck, you may re-spawn it at any time by toggling the "Inspect" button. The Leitzentrale subsystem empowers you to interactively inspect and tweak the running system. Let's take a walk next. To change the keyboard layout to German, change "en_us.chargen" to "de.chargen" and save the file. The change becomes effective immediately at saving time. After saving the file, a Vim user's life suddenly becomes much more pleasant. 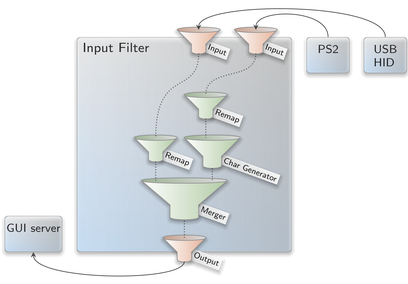 Take the time to review the remaining parts of the input-filter configuration. The nested configuration nodes define a hierarchy of filters that are applied in the order from the inside to outside (Figure 5). There are filters for merging events (<merge>), remapping buttons and keys (<remap>), supplementing symbolic character information (<chargen>), pointer acceleration (<accelerate>), and emulating a scroll wheel by moving the pointer while pressing the middle mouse button (<button-scroll>). If you are running the Intel graphics driver, you can inspect the connected displays and their supported resolutions by taking a look at the report at /report/drivers/dynamic/intel_fb_drv/connectors. This report is updated whenever a display is connected or disconnected. You can use this information to enable or disable a display in the driver's configuration, which you can find at /config/fb_drv. Please don't forget to correctly specify all attributes including the hz attribute. Otherwise, the driver will not consider the <connector> setting. For a quick test, change the attribute height="768" to force_height="768" (you may modify width analogously). When saving the file, the screen real-estate will forcibly be limited to the specified size. This is helpful during presentations where the projector has a lower resolution than the laptop's internal display. By specifying the beamer's resolution, both the laptop and the beamer show the same content. You can review the construction plan of the drivers subsystem by opening the file /config/drivers in Vim. In particular, it is interesting to follow the <route> rules to see how the various components are connected. But there is more. The configuration is live. It enables you to reconfigure individual components on-the-fly. For example, search for the <start> node of the PS/2 driver and add the attribute verbose_keyboard="yes" to the embedded <config> node. By saving the file, the changed configuration becomes effective. Any key pressed or released on the PS/2 keyboard will result in a log message on the right. You may revert this change (vim: u) and save the original version of the file. Note that not all components are dynamically reconfigurable but many modern ones - in particular the init component and most long-running server components - are. It is possible to forcibly restart a component by adding a 'version' attribute to the <start> node. Whenever the version value is changed, the component is re-spawned. The component-specific configuration options are documented in the README files accompanying the respective components in the source tree. Change the transparency of the two noux instances by modifying the alpha attribute of the fader component. Change the font size of the log_terminal component from "10" to "18". You may also enjoy tinkering with the configuration of the nitpicker GUI server, which is located at /config/nitpicker. For example, you may change the background color or the labeling color of the "default" domain. 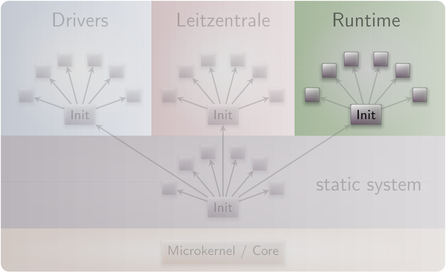 So far, we have not lost any words on the third subsystem called "runtime" that exists besides the drivers and Leitzentrale subsystems. The runtime subsystem has no predefined purpose but can be filled with life at your wish. Analogously to the drivers subsystem, the current configuration of the runtime subsystem is located at /config/runtime. Where the initial Sculpt EA version required the user to control the runtime configuration manually, Sculpt TC automates these steps through the interactive Sculpt manager that is hosted in the Leitzentrale subsystem. You can click on any of those items to reveal possible operations of the selected item. For the start, it is best to experiment with the "ram" in-memory file system. In the previous section, we have already launched the inspect window via the "Inspect" button of the in-memory file system. By additionally selecting the "Use" button, we tell the Sculpt manager that we intent to use this file system as storage location for the Sculpt session. This has two immediate effects. First, any files present at config/<version>/ at the selected file system are copied to the config file system. As the RAM file system is empty, no files are copied. Second, the so-called depot/ is initialized at the selected file system. The depot is the designated place for the installation of software packages. By default, the depot is initialized such that the Sculpt system accepts software published by Genode's core developers. You may inspect the content of /ram/depot using the inspect window. The second dialog of the menu presents options for network connectivity. In order to install any software packages, one needs to select either "Wired" or "Wifi". In the latter case, one is prompted with the selection of an access point and the WPA passphrase (if needed). Once connected, the network dialog displays the IP address of the machine. With a file system selected and an Internet connection, it is time to install and run additional software. The interface for software installation and deployment is the /config/deploy file. It contains a number of commented-out template snippets for various subsystems. As a first test, uncomment the <start> entries for the fonts_fs, wm, and backdrop. When saving the file, the Sculpt manager will automatically kick off the download of the selected packages and its dependencies and thereby populate the depot. Once the download has completed, the packages are started. Pay special attention to the <route> definitions. They define how the respective subsystem is connected to other parts of the system. For example, by default, the backdrop is directly connected to the nitpicker GUI server of the base system (parent). By changing the route from <parent/> to <child name="wm"/> the backdrop subsystem will be connected to the window manager instead. Whereas the RAM file system is practical for quick tests, it goes without saying that we want to persistently store data, programs, and configuration information on a storage device. Sculpt TC supports SATA disks, NVMe devices, and USB-storage devices. The storage dialog lists all devices detected by the drivers subsystem. A click on a device reveals possible operations or - if a partition table is present - more details about the device structure. Depending on the operation selected by the user, the Sculpt manager will automatically reshape the runtime subsystem to perform the selected operation. For example, by selecting the "Format device" operation, the Sculpt manager will create a noux instance with the selected block device mounted at /dev/block and e2fsprogs mounted at /. 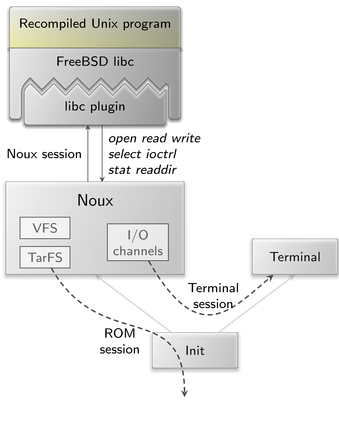 The noux instance runs mkfs.ext2 as init process. Likewise, an existing EXT2 file system can be checked by activating the "Check" button, which triggers the execution of fsck.ext2 for the selected file system. A particularly interesting option is presented at the last partition of the Sculpt USB stick. Initially - right after copying Sculpt's tiny disk image to the USB stick - the partition is only a few MiB in size. However, using the "Expand" operation, the partition can be extended to the full size of the USB stick, which makes enough room to use the USB stick as Sculpt file system. This clears the way for sculpting a custom live system stored entirely on the USB stick. All file systems supported by Sculpt present an "Inspect" button. By toggling this button, the selected file system becomes accessible in the inspect window. Note that more than one file system can be inspected at a time. Each file system will appear as a directory at the root of the inspect directory tree, named after the corresponding device and partition number. This way, the inspect window becomes a convenient tool for copying files between file systems. Under the hood, the Sculpt manager spawns a file-system component for each inspected file system, which translates the notion of files and directories to block-device accesses. It is possible to make any customization of the config file system permanent by copying the modified files to a directory named config/<version> on a persistent file system where <version> corresponds to the Sculpt version number as found in the /VERSION file. Each time, this file system is selected for "Use", those files will be automatically copied to the in-memory config file system. Note that this mechanism works even for the /config/deploy file, which allows one to restore a once sculpted system composition directly at boot time. An entire SATA or NVMe device used as a single EXT2 file system (as devised by Sculpt EA). The storage dialog hosts a convenient "Default" button that allows one to toggle a partition label between "GENODE" and "GENODE*". For example, the last partition of the Sculpt USB stick can be marked as default or non-default using this button. The config/deploy file contains several example subsystems that are installed on demand when uncommenting the corresponding <start> nodes. A file-system server that transforms TrueType fonts into glyph images, which become thereby accessible as virtual files. This provides a hook for customizing the font size of any component that uses the font server, and relieves components from depending on a specific font-rendering library. According to the <route> information, its configuration is taken from /config/managed/fonts. The fonts_fs is used by the graphical terminal of the noux subsystem and the top_view application. A window manager that displays clients in windows that can be arranged with the mouse. A wallpaper that adjusts itself to any screen size. A noux instance with a graphical terminal, similar to the inspect window of the leitzentrale. Note the routing of the various file-system sessions. A file-system server that provides the /shared sub directory of the Sculpt file system as a new file system. A client of this server won't see any other parts of the file system. A hook for assigning USB devices to a virtual machine, explained in Section Updating the USB boot device from within VirtualBox. A file-system server that provides the /vm/debian/ sub directory of the Sculpt file system as a new file system. It is explained in Section Hosting a guest operating system. An application that shows the CPU load, similar to top. A Threes! inspired puzzle game running in a native Libretro runtime. A throw-away virtual machine for running Firefox on TinyCore Linux. It uses VirtualBox as virtual-machine monitor. The same virtual machine as vbox5-tc-browser but executed inside the light-weight Seoul virtual-machine monitor. Qt5-based text editor that is explicitly granted access to the config file system. You may change the route to other file-system services. For example, by specifying <child name="shared_fs"/> instead of <parent label="config"/> you can edit the shared folder of vm subsystem. The default deploy configuration found at /config/deploy contains all the pieces needed to host a virtual machine on top of Sculpt. A virtual machine (VM) is a convenient stop-gap solution for running programs that are not yet available natively on Genode. It ultimately enables us to use Sculpt as day-to-day OS today. By convention, we host the content of each VM in a dedicated directory /vm/<guest-os>/ at the file system. The VM directory contains a virtual disk image(s) as well as the VM configuration. To install the ingredients for running Debian in the VM, you may start the download_debian subsystem, which will automatically download the ISO image of the Debian installer and install a reasonable VM configuration. The subsystem requests a file-system session that points to the target directory. To pass the /vm/debian directory to the subsystem, the file-system session is routed to the vm_fs component. Please make sure to uncomment this component along with the download_debian subsystem. "vm" - the virtual machine. After saving the file, VirtualBox should appear, starting the Debian installer. Having the Linux-header package is mandatory as the needed modules will not be built without it. After the packages are installed and the modules have been built, certain features like the dynamic mode-setting and shared folders can be used. it can be mounted and accessed via /mnt. Triggering the download of missing depot content on demand. This convenience comes at the price of built-in policy, which may stand in the way of sophisticated scenarios. For this reason, almost all policies of the Sculpt manager can be manually overriden by manually managing configuration files. Now, the copy at /config/nic_router can be edited. Note that changes usually take immediate effect. Installing depot content manually by managing /config/installation by hand. This includes the ability to download the source code for any package. Disarming the automated update mechanism by using a /config/installation file with no <archive> entries. Fixing the current state of the runtime subsystem by copying /config/managed/runtime to /config/runtime. This allows one to manually tweak and inspect the runtime in any way, e.g., to enable additional reporting when troubleshooting. Manually defining the default font sizes by creating a custom config/fonts configuration. Managing Wifi credentials manually by supplying a custom config/wlan file. To revert any manual customization, delete the corresponding file. In this case, the Sculpt manager will take over again. Note that all manual customizations can be made permanent by following the steps explained in Section Making customizations permanent. Section Building the boot image presents the creation of the boot image from pre-built packages. You may want to build those packages from source, in particular for customizing the system. The ingredients of the boot image are subsumed by the pkg/sculpt package. The default set of software installed by the update runtime is defined by the pkg/sculpt-installation package. You can find the depot recipes for these packages at repos/gems/recipes/pkg/. The FORCE=1 argument ensures that source archives are re-created and checked for the consistency with their versions. If the source code of any of the archives changed, the UPDATE_VERSIONS=1 argument automatically updates its version. Please don't forget to commit the updated hash files. The empty REBUILD= argument limits the creation of binary packages to those that do not yet exist in binary form. If not specified, the command would recompile all packages each time. You may further add -j<N> to parallelize the build process where <N> is the level of parallelism. Building the sculpt-installation package works analogously to the sculpt package. The first part is the version. The second part is the content hash of the version. For more information about working with the depot tool, refer to http://genode.org/documentation/developer-resources/package_management. Rename the attribute label_suffix to label. The updated usb_devices ROM prompts VirtualBox to open a USB session at the drivers subsystem. Hence, when saving the modified /config/deploy file, the guest OS should detect a new USB device (check the output of dmesg). You may now write a new version of the Sculpt ISO image to the device by following the steps described in Section Building the boot image. Sculpt is an example system scenario of the Genode project, which is an operating-system technology designed and developed from scratch. That said, Genode is not developed in a vacuum. It rather stands on the shoulders of giants and greatly benefits from the free-software/open-source community. The following projects play a particularly important role for the Sculpt scenario. Sculpt's kernel is a derivate of NOVA, maintained by Genode Labs. NOVA was originally created by Udo Steinberg http://hypervisor.org. 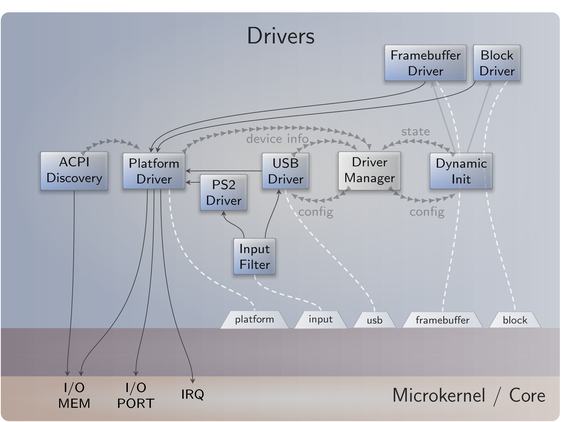 Sculpt reuses several Linux subsystems as individual components, in particular the USB stack, the Intel wireless stack, the Intel graphics driver, and the TCP/IP stack. The file-system support is based on NetBSD kernel code, which became reusable on Genode thanks to the rump kernel project. The C runtime that is used by most 3rd-part software is based on FreeBSD's libc.